Metal maniacs, rejoice! I am proud to present to you: MEDALYON; signed via Arkeyn Steel Records, hailing from the United States of America - performing Power Metal, on their debut re-release album entitled: “Visions” (released in August 27th, 2018). Since formation in 1987; the band in question have 2 Demos, 2 EPs, 1 Single, and 2 albums in their complete discography – having split up in 2001, Arkeyn Steel Records decided to bring forth and resurrect MEDALYON from the dead, re-releasing their debut album “Visions” & “In The Test Of Time” respectively for the next generation. 17 tracks ranging at around 70:80; the band arrange an intricately designed formula of Power Metal developments, the introductory and operatic track: “So Uncertain” begins the record until the boistrously catchy “Just A Thought” accelerates with amplified adrenaline - injecting inventive aesthetics of progressively technical vehemence. The band contrast with professionally persistent vocals, amalgamated with crunchy rhythms and skill. Consisting of Rick A. Shay on vocals; the frontman consistently conveys in flamboyant pipes of high-pitched finesse, with a rawly riveting relentlessness to it. The bouncy “All Your Days” constructively distinguishes diligent anthems of stability, ultilized with unprecedented stampedes of thunderously blistering riffs and solos from guitar duo Tom Eframedes & Robby Nemeth - implementing organic orchestration with rapidly swift nimbleness. “Victim Of Circumstance”; “Time To Learn” & the titular track demostrate complexly conceptual dexterity, distributing battering diversity in which hammers with harmonic melodies and meticulous manifestations - powerhouse drummer Ray Zale attributes with articulate establishments of efficiently captivating pounds of solid specialities. “Move Along” embellishes on creatively crafted elements with an attention to detail that results in profusely robust ramifications, rambunctiously supplying pummelling bass adroitness from Brian Louis - who showcases salubrious versatility. “Trouble” also provides thumpy tinkering with weighted onslaughts of old-school Power Metal distinctions, chugging and galloping with concretely gritty hymns of battle hardened executions - converged with elements that pursuits with psychedelic seamlessness. “Bottom Line” examines enlightening yet fulfilling substances in which portrays professional songwriting memorability, and originality - frolicking with wildly rushing machinations. “Never Goodbye” is an anthem of poetic proportions, generating epic acoustic components with more elegantly exquisite dynamics. “Kristina” is a dramatic tale, variating with speedily rampaging stomps of steel that is balanced with a borderline foundation of fluidly polished instrumentation & musicianship - similarly profound in “Don’t Want To Be In Love”, which is a song that I can relate to. “Soldier Boy” is a unique one, blending catchy grooves with an efficacious and melodious granduer that manages to keep me hooked with the grandiose sounds of mid-tempo grabs. “Am I Dreaming?” is another ballad, toning down the exhilerating blasts of bashing enjoyability with this equally entertaining tune. “Rock Will Pull Ya Through” does exactly what it says on in the title, overall concluding the record with demo versions of “Never Goodbye” & the heavily heated finale with “Master Of Your Mind”. 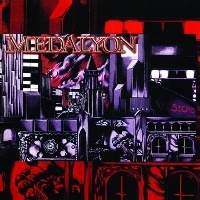 Bottom line; I discovered Hard Rock roots with MEDALYON’s first reissue, “Visions” evolved the sub-genres that make me believe they are very quite important. It is a shame they disbanded, as they certainly outdone themselves here.